We have seen the first flexible displays long ago and since then we have wondered when will we get the first flexible devices. While we don’t yet know the answer to the last question, we now know that Samsung is the first company to starting mass production of bendable screens in the first half of 2013, and that is one of the biggest steps towards flexible devices. Samsung’s display division, Samsung Display Co., has entered the last phase of the development of flexible displays. It is not yet clear how much Samsung has invested in the technology, but it is coming up. Probably the best thing about plastic flexible screens is that they are much harder to break than brittle glass. As we are starting to reach a point when resolution on screens becomes more higher than the human eye can discern, phone makers will certainly look for new and different ways to bring innovation and extra value, and finally margins to their products. The new Samsung displays will use the OLED technology, layered on top of a plastic foil. While Samsung is the first, it is not the only one that is doing research in flexible screen. LG, Sony and Sharp are also developing similar solutions. This is actually kind of exciting! That would be more exciting if the acctual phone/device would be all flexible! We likely won't ever realize flexible phones in our lifetime. Granted, I'm assuming we're all going to be dead before the end of Obama's presidency. Zing! You cant make predictions! People in the 50' wouldn't believe you if you said them that in other 50 years they could speak to someone on the other side of the globe. And now that Science is developing more than anytime before I DO BELIEVE THAT IS POSSIBLE WITHIN 5-10 YEARS. Wiff (Sound of joke whizzing right past). In 1989, everyone believed we'd have Hoverboards by 2005... and STILL no sign of them. It was in a documentary, I believe it was called "Back to the Future". I love hearing good news about Samsung. make it 1080p and you have the embodiment of perfection. also, someone patent this ASAP. 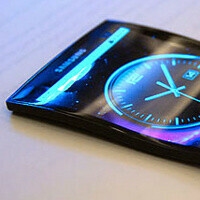 Its really exciting but a while before we see flexible smartphones as the components inside are still rigid. With that in mind, I think it may be possible to embed electronics to make flexible screens possible in other form factors at the start. A phone with a removable screen would be interesting. Futuristic Phones Is On Its Way!! Finally! I hope the first flexible phone isen't named something corny like the "Samsung Flex" or something stupid like that lol. Put a flex screen on Nexus device and I might have to take a break from buying HTCs lol. now this is true innovation.something that Apple lacks bigtime. other than siri, there is nothin new or innovative at all in their products.i really hope samsung acquires all the patents regarding flexible screens and leave apple gaping..
Another Apple fanboy on "thumbing down" rampage. It happes from time to time on some Android articles. I want this in a phone. As the article stated, flexible is far less prone to breaking. Black ops 2 wrist phones here we come! Can someone please make a decent smart watch now since we have flexible screens coming out next year? I really want one, but no good options available today. They wont because there is no demanding for such technology in global market. ot yet.